When I left my job in Textile Design I’d been working 9 to 5 for six years and maintaining a routine I was accustomed to was crucial, both then and now. I get up at the same time everyday and get ready like I’m going to work in an office! I might even pop to the shop to have a little walk, helping to fool my brain into ‘work mode’ I also make sure I finish work at a similar and reasonable time each evening. I’d enjoyed group classes like aerobics before freelancing but in this new life they took on a whole new meaning; as pillars of consistency in my week. Body conditioning on a Monday morning kicks things off and Yoga on a Friday afternoon winds me down. I also love and recommend Yoga with Adrienne a treasure trove of free you tube tutorials that totally help me find zen when I’m stressing over a lack of clients or a looming deadline! I personally love reading, both fiction and non fiction depending on my mood! Researchers at the University of Sussex have shown that six minutes of reading reduces stress by as much as 68% so before bed (realistically I have a quick scroll through instagram but then) I pick up a book and get into it as reading does wonders for my sleep! So what about actually having a productive day? Well for me I have to trick my mind into ‘flow state’ by distracting it with something else! Then I stop over thinking the task and get on with it! Different things work for different people; I know fellow creatives who listen to TV programmes and others that enjoy music. Personally I’m all about podcasts and preferably something that isn’t related to my work or business, as that could take me out of flow. My favourite is Reply All which is quirky weird stories about the internet that I can really get lost in! The freelance life can be a lonely one but the lovely internet that is helping us work from home is also helping us to connect with others on the same path! These communities whether online or IRL are full of people who totally get the ‘own boss’ struggle. I love being a member of online Facebook group Indie Rollercoaster where I can complain when a manufacturer has let me down and ask others advice. I also like going to Ladies wine and Design London to socialise with fellow creatives! There are loads of groups out there and many can be found on Meetup so find something that appeals and works for you! 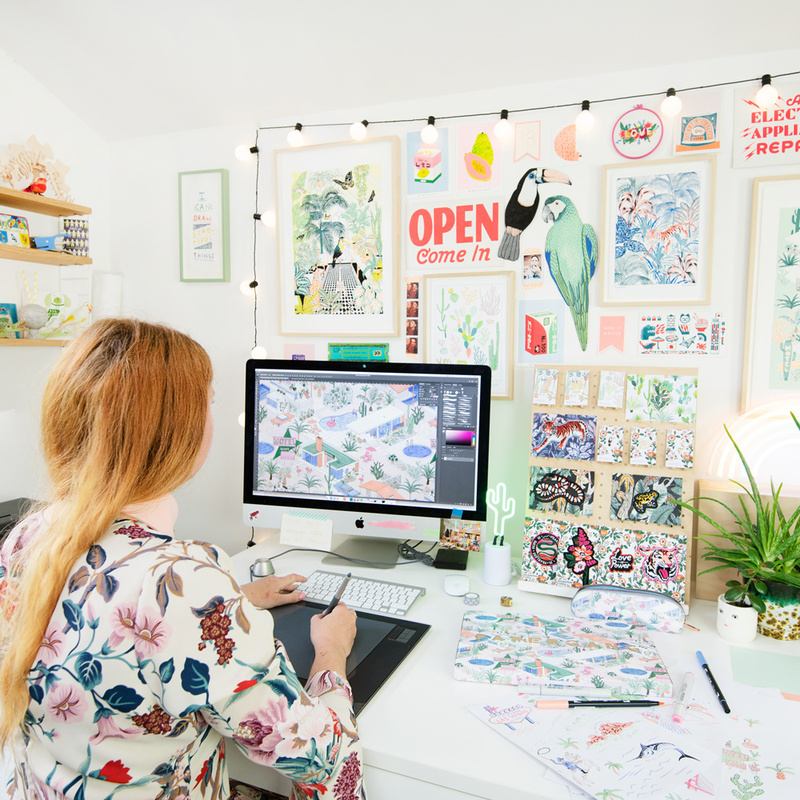 Jacqueline is an illustrator and pattern creator based in Hackney, London. If we had to use 3 words to describe Jacqueline Colley's style; they would be exotic, distinct, and explorable. She has worked for the likes of Topshop, Oasis, HEALS, and has also taught at the V&A in London. One of her inspirations is Where's Wally, as you can tell by her patterns: you can get lost in them!